From time-consuming audits to expensive penetration tests, evaluating a company’s security posture can seem like a daunting task. However, today’s organizations are increasingly adopting Security Rating Services (SRS) as a means to quantify and monitor their own cyber risk, as well as the risk of their third party vendors. So, how should you go about using security ratings? What’s the real difference between different rating services? And how does that impact your business? 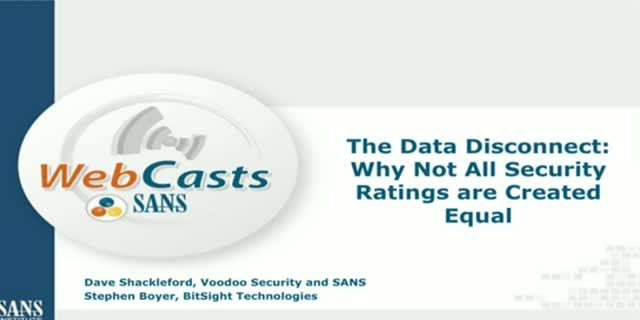 Join BitSight Technologies’ CTO and Co-founder, Stephen Boyer, and Dave Shackleford of SANS as they discuss the importance of curating high-quality data for security ratings and explore why verifiable data should be at the heart of any security rating solution.